What exactly is a modular home? ​"It's just a house," says Larry Wilkinson, a consultant working with Oak Creek Homes, one of several modular home manufacturers in Texas. "They are largely self-contained units built in a factory and assembled at the home site." Modular homes use the same framing systems and material applications as site-built homes. Modular homes are not the same as "manufactured housing," which is constructed according to the 1976 Federal HUD (Department of Housing and Urban ​​Development) code. 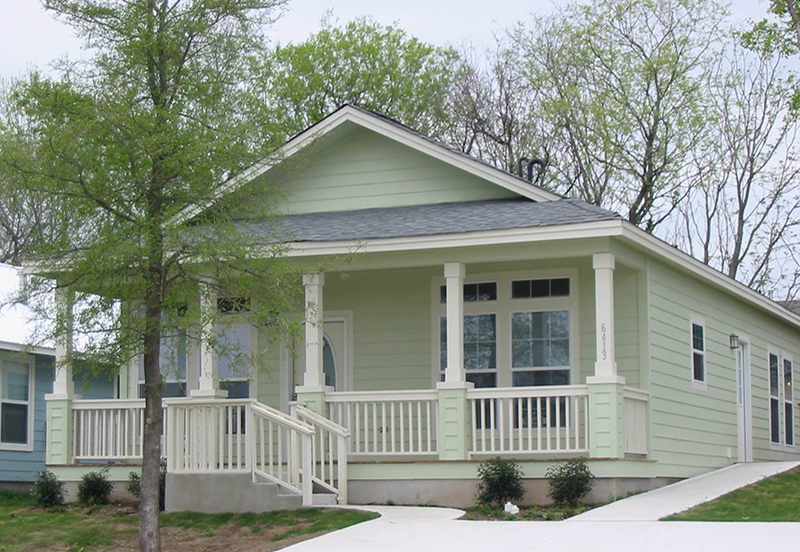 In Texas, residential modular homes are built ​to the same building codes as site-built homes. This means they may be seen in a city's traditional residential neighborhoods as well as rural areas. According to the Texas D​​epartment of Licensing and Regulation, a municipality must accept modular housing constructed under the Texas Industrialized Housing and Buildings (IHB) program. "If an area is zoned single-family residential, then the municipality must accept an IHB-qualified single-family residential building into that area. However, any deed restrictions filed of record affecting modular housing must be abided by," says Wilkinson. Under Chapter 1202 of the State Occupations Code, a municipality may not require or enforce any amendments to the mandatory state codes for "industrialized housing" (the state's terminology for modular housing) as a prerequisite for granting construction permits or certificates of occupancy. In coastal counties, modular homes must also meet the Texas windstorm construction requirements if buyers want to qualify for Texas Department of Insurance windstorm coverage. Depending on location, a qualified home's wind rating will fall between 90 and 140 miles per hour. Modular homes are always classified as real property. This means comparables for appraisal purposes must be other similar site-built or modular homes. The law does grant municipalities authority to adopt state-permitted ordinances affecting modular homes. For example, a city may adopt an ordinance requiring single-family modular housing to have a value equal to or greater than the median taxable value for each single-family dwelling located within 500 feet of the proposed modular home installation site. This is known as the "500-foot rule." "Under the rule, an audit of homes within 500 feet of the proposed site is conducted," says Wilkinson. "The modular home should complement existing homes with similar construction elements, such as size, roof pitch, exterior siding and window style." A check of six modular single-family homes located within the City of Austin and built between 2003 and 2008 revealed that their values were similar to nearby site-built homes. According to Travis County central appraisal district data, the modular homes ranged from $146,000 to $732,000 in appraised value ($108 to $375 per square foot) and 1,330 to 2,430 square feet in size. Modular homes are subject to a stringent inspection process, both in the manufacturing facility and in the field. "In the facilities where the modules are constructed, manufacturers will have both their own quality control inspectors and outside third-party inspectors," says Martin Montgomery, P.E., principal engineer/owner of RCS Enterprises LP. 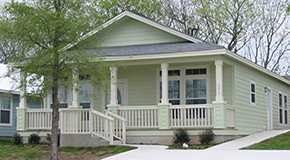 Before a modular home is built, a third-party engineering company performs a design review and must approve modular home plans sent by the manufacturer to state IHB officials in Austin for final approval. Any steps, decks, porches or attached garages must be designed and approved by a professional engineer. "Foundations for modular homes have to be designed and approved by a professional engineer," says Montgomery. "The amount of engineering and inspection that goes into modular housing is extensive, and that's a good thing for homebuyers." The party inspecting the homes in the field will vary. "Out in the county, department-approved, code-knowledgeable, third-party code inspectors will carry out at least three inspections at the home site," says Wilkinson. "Within municipalities and their extraterritorial jurisdictions, they will be conducted by city inspectors." "There will first be a pre-pour inspection of the foundation," says Montgomery. "Next comes an inspection after the modules have been field installed and set on the foundation. Last will be a final inspection where everything is looked at." Another layer of protection comes from the licensing of various parties involved in the process. Modular builders must be licensed by the state as "industrialized builders" while manufacturers must be licensed as "industrialized housing manufacturers." A full list of industrialized builders and manufacturers​ can be found here. Plumbing, electrical, HVAC and other specialty subcontractors must be licensed by their various state regulatory entities. Modular home sales in Texas have historically been quite limited, averaging about 700 units annually since 2011 according to DJ Pendleton, executive director of the Texas Manufactured Housing Association. However, with the recent shortage in skilled labor available to Texas residential builders, modular housing may become a more viable alternative to site-built housing than it has been. Montgomery has seen an ebb and flow of interest in modular from site-built homebuilders over the years. "Modular housing works well in areas where labor is tight," says Montgomery. "Areas that have experienced heavy oilfield activity such as Midland would be a good example in Texas. The tighter the labor, the better modular works." "Just finding a homebuilder in some rural areas of Texas can be a challenge as well," says Keith Alexander, division president and general manager of Palm Harbor's Austin manufacturing plant. "Many homebuilders have no interest in building in rural areas." A recent builder survey by the National Association of Home Builders (NAHB) noted "shortages of labor and subcontractors have become substantially more widespread since 2013." In the NAHB survey, 65 percent of builders revealed they paid higher wages/subcontractor bids, 62 percent admitted labor shortages had raised their home prices, and 60 percent said labor shortages had created difficulty in completing projects on time. "The ability to construct housing without delays in a climate-controlled environment, especially during winter months, is a huge plus for modular," says Cal Davis, Homebuilding PR and communications specialist for Clayton Homes, another Texas manufacturer of modular housing. Materials are less exposed to the elements in factory construction applications. "Ask any homebuilder who is frustrated with subcontractors or whose timetable is severely thrown off by weather if they would prefer less delay and less headaches to achieve their same quality result," says Pendleton. "Financing entities also like the fact that the time to design, build and assemble a home is significantly reduced," says Davis. "With modular construction, site preparation and foundation work can carry on at the same time the structure is being built." "Another advantage is the ability to ramp up capacity if demand should increase," says Montgomery. Manufacturing operations use integrated computer systems to efficiently manage and monitor the construction process in real time. This also results in minimal material waste. The ability to purchase material and appliances in bulk offers volume purchasing power. This keeps the costs competitive with site-built homes, even after module transportation is factored in. "Direct cost comparisons are difficult, because the level of material options and design customization can vary a lot with both modular and site-built homes," says Wilkinson. Finally, the level of neighborhood disruption can be minimized in urban infill applications when modular housing is used. As the structure is not being constructed on-site, the amount of time and personnel on location should be shorter than with site-built homes. One limitation of modular housing is the size of a module that can be transported at a reasonable cost. "We are pretty much limited to modules that are less than 16 feet wide and 76 feet long," says Wilkinson. "Any larger and transportation costs begin to increase exponentially." Height is another consideration. The maximum cost-effective height for highway delivery in most of Texas is 15½ feet. With consumer preferences favoring steeper roof pitches and taller interior walls, creative construction designs have become necessary. "Manufacturers developed a hinged roof system to handle the problem," says Wilkinson. "It's flat while being transported but swings up to the designed pitch when the home is assembled at the site." Lower delivery height can also improve site access in some cases. 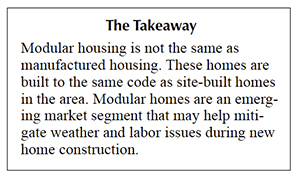 The typically long, narrow geometry of modules creates another challenge: comparisons to manufactured housing. "Stigma is probably one of the biggest hurdles modular housing has to overcome," says Jayar Daily, vice president of operations for American Homestar Corporation (Oak Creek Homes). "The perception has been that modular is somehow inferior to site-built housing," says Davis. "I know that's not true. But it's our job to properly educate the public about the benefits of modern modular housing." "Many builders and financial institutions are often unfamiliar with the state's industrialized housing program as well," adds Alexander. One factor that can affect this perception is the choice of "off-frame" or "on-frame" modular construction. As a rule, the homeowner chooses one of the two systems. However, some private lenders mandate the use of off-frame construction. Government financing entities such as FHA and VA to date have no preference. In on-frame construction, the module is built on two steel beams used to transport it to the site just like manufactured housing. The steel beams are then integrated into the foundation system. Off-frame modules are designed around a traditional concrete or wooden pier and beam foundation system. The modules are transported to the site on factory-built chassis transports and then lifted into place with cranes. "On-frame would be my preferred system," says Montgomery. "The steel beams offer extra structural support, and it's probably at least $5,000 less expensive than off-frame construction. The finished homes can be made to look the same using either system." Problems generally arise when city inspectors see a modular unit coming in on wheels and the frame not leaving. "They think you are delivering a manufactured home, not modular," says Montgomery. City officials have been known to block installation until legal wrangling clears up the fact that it's modular construction. All modular homes will have a dataplate identifying it as modular construction and noting the specific building codes it was constructed to. Montgomery concedes that modular homes headed for suburban or urban infill applications are probably better off using off-frame construction to avoid conflicts with local officials. The design flexibility in modern modular floor plans continues to improve with the increased use of computer-aided design software. The hope is that potential modular homebuyers will find greater aesthetic appeal in designs that are increasingly moving toward more open floor plans and away from a basic box configuration. One interesting new modular product on the horizon is a hybrid prototype called Home Core under development by Oak Creek homes. The kitchen, bathrooms and utility room are constructed as a single modular "core unit," leaving the remainder of the home to be stick-built around it. The result is a home where 90 percent of the electrical, plumbing and HVAC work and 100 percent of finished cabinetry work is completed at the factory. The stick-built portion can be completed at the site with only a framing and finish installation contractor. The factory unit will include the HVAC ductwork, furnace and closet-mounted air handler/blower. The outside condenser unit will be installed by an HVAC contractor at the site. "Home Core modules we've designed are typical examples for a potential builder to consider, but we realize that each builder will have their own ideas for what they might want in their core units," says Charley Boyer, chief operating officer/vice president of the manufacturing division for Oak Creek Homes. "We see Home Core units working well with affordably-priced home developments," says Boyer. "Module sizes of 15¢ × 36¢ or less allow two Home Core units to be delivered on one carrier system, reducing freight costs from the factory to the building site." "This new hybrid approach to team up with traditional custom site-built homebuilders shows that technology and innovation are not only occurring inside factory walls but beyond to tap into other markets where we can sell our products and produce quality housing options," says Pendleton. Dr. Hunt (hhunt@tamu.edu) is a research economist with the Real Estate Center at Texas A&M University.